Picture this: The year is 2022, our new state-of-the-art Intensive Care Unit has just opened its doors and our most critically ill patients need to be transported, along with their complex equipment, to the brand new department 13 floors below. Figuring out how we will orchestrate this move while keeping our patients safe is one of many questions that need to be answered through collaboration and creativity. At a facilitated session last week, a multi-functional team began planning for the future ICU and proactively identified all of the potential problems that need to be solved in advance for a seamless transition. They also looked at floor plans, envisioned their future workflows and identified what they will need to provide the best possible patient care in the new space. 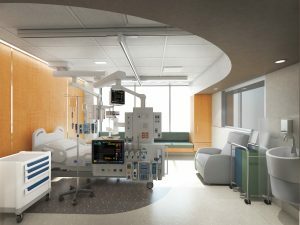 Glimpse into the future of an Intensive Care Unit patient room. Learn more about Mount Sinai’s ambitious redevelopment journey at RenewSinai.ca.